Here some tips from Glenn Rangiuia one of the hunters who has visited us this year. Read his experience with C&C Outfitters. Over the duck season I talked to shooters who had shot doves in Cordoba, Argentina, which lead me to the internet. Wow! Some experts estimate 50,000,000 doves in the Cordoba area. Why are they there? Perhaps the 150 million tons of grain grown annually and the no-till regime has something to do with it. The main target for hunters is the Eared Dove, a small bird weighing 100-112 grams and 200-240mm in length. We shot doves coming home to roost after a day feeding and they were so laden with grain that they burst open when they hit the ground. We opened three up and they held about 30 grams each, mostly sorghum with a few soy beans to top it off. So if my math is correct, 50,000,000 birds eating 30 grams per day equals 500,000 tons of grain a year. climate and doves being able to breed up to four times per year they can reach plague proportions very quickly. The pigeon is the more challenging bird and there are two varieties, the larger Pica Zuro and the more common Spotted Pigeon, better known in Argentina as “Pichon”. These birds are a real challenge – they fly faster and often jink and swerve in flight if they see the hunter moving. Many outfitters place a limit on these birds of 200 per day but we shot where the birds were coming in to feed on a sorghum crop and there were no limits. So there are plenty of birds but what happens to the shot ones? They are collected and given to locals. We tried pigeon’s breast on the “Asado” which is the Argentinean equivalent to a BBQ, and they were very nice, but when we had breasts lifted off the bone, soaked in milk, and fried in a pan with garlic they were exceptional. through it. I borrowed Editor Peter Maxwell’s Benelli Montefeltro 20 gauge. 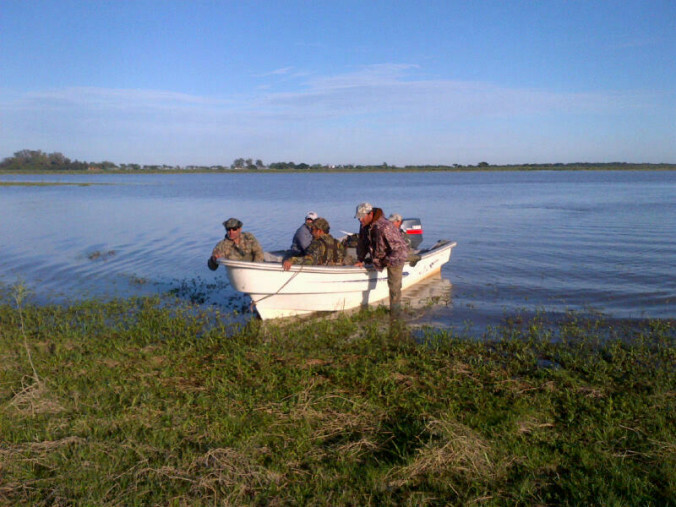 You have to pay an entry fee (RENA form) to get the guns into Argentina, at a cost of $US125.00 per gun. We had no trouble landing in Buenos Aries and clearing our guns through the Police and Customs. If you really like your gun, take it, but it is easier to hire a gun from the outfitter at US$60 per day. C&C Outfitters run Beretta 391 semi-autos, a couple of Winchester X3s and a couple of Remington 11-87s in 20 and 12 gauge. We had a transit stop in Santiago (two hours in-bound, five hours on out-bound) and had to show paper work for the guns even though they were supposed to be in transit! It was only a little hassle. The same thing happened on the return flight home. varied from US$12.50 to US$15.00 per box. would blow a huge amount of feathers off a bird only to see it continue on for some distance. The next morning we were up early, 6am to have breakfast and drive about 20 minutes to a pigeon feeding ground. Miguel had been out scouting looking for flight paths so he could position us under the birds. It worked as I had 1000s of birds come over my hide. Simon had fewer birds but he shot accurately and his tally was higher. I hit 312 in the morning compared to his 335 and in the afternoon I shot 346 to his 366.
bird population was making a feast of it. While we were shooting a couple of Gauchos were working the bulls in the lot right against the hide, “No problems, keep shooting,” said Miguel! It freaked me out how happy the locals were to carry on working while we were shooting very close over them. but there are plenty of mosquitoes so take some repellent. We found Ridgeline clothing to be great – I wore their Recoil Jacket in Wapiti camo and Simon chose the Mallard jacket in Grasslands camo. Both blended in to the local foliage. always ready with a handful of shells for reloading our guns, or pointing out incoming birds. These guys could load the guns so fast that we could shoot almost continuously. When we needed a drink they would produce whatever we wanted from the cooler, water, beer or a soft drink. They also set out camp beds so we could take a short nap after the huge three course BBQ lunch. The drive to Santa Fe was the worst part of the trip; the back roads are all dirt and as rough as farm tracks here in New Zealand. track to the hunting area and Roberto knew all the good spots. We used canoes to get over the large drain and out to our shooting stand. The swamps are huge by our standards. We shot standing in the thigh deep water with a few decoys and some temporary cover. The outfitter will supply waders for the duck hunts. As first light appeared in the east the ducks started to fly past. Most of the ducks we shot were passing shots but there were hundreds of ducks to shoot at and they kept coming. The Birdboys called the ducks with a whistle made from the brass end of a 12 gauge cartridge. None of the ducks quacked like they do here. We shot a 101 ducks by 11am on the first morning. can get you an extension until October. We paid the outfitter US$4046.00 (each) for eight days accommodation, food and beverages, and 10 half day hunts. This did not include the ammunition, tips, licence fees, gun import fees etc. We shot doves, pigeons plus three days on ducks. Our ammunition tally was 345 packets (8625 rounds for 5366 birds) between us. You pay a local licence fee of $US50 – 65 per day and this money goes to the landowners. You tip the bird boys US$50 per day and US$100 per shooter for the entire stay to the staff of the hunting lodge. Our total cost including accommodation in Buenos Aries was $US6546 plus $NZ2600 airfares per shooter. shooters is the standard. We paid an extra $US300 surcharge for two shooters. Duck shooting will require a drive from the dove lodge to Santa Fe, which can be 4-8 hours depending on where you shoot. 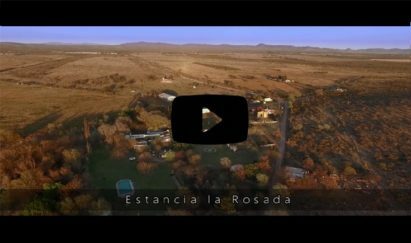 We chose C&C Outfitters, and their lodge La Rosada, it has six double rooms all with full bathrooms. We were the only shooters there at that time. The lodge is a two hour drive from Cordoba Airport. C&C Outfitters has a large presence on , with many hunting videos. Their service is top notch and the owner, Nacho, endeavours to get you the best shooting experience he can. The Birdboys, accommodation and staff were very professional and friendly. From when they picked us up at Cordoba airport until they delivered us back for our flights home they went full out to provide for us. Nacho is a 100% professional who looks after his clients. hard to go again in a couple of years. 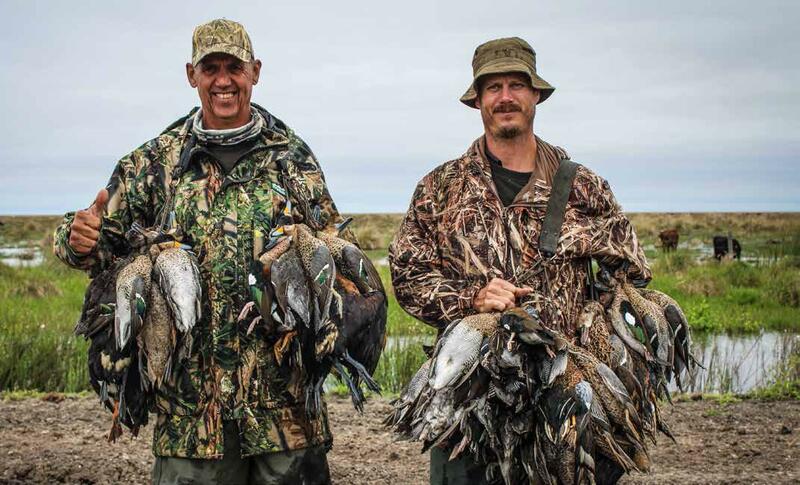 If you love to hunt with a shotgun you owe it to yourself to go to South America and tick it off the bucket list. How to improve your shooting?